I am pleased to add Koble to our suite of solutions for SMEs and enterprises. Celcom and Axiata, with a wide LTE coverage and a suite of solutions, are excited to play a major role in assisting both small and large businesses. ~ Mohamad Idham Nawawi, Chief Executive of Celcom Axiata Berhad. Today, Koble, a leading global business-to-business matchmaking platform, through its exclusive Asia-wide partnership with Axiata Business Services Sdn. Bhd., (Xpand), officially launched in Malaysia with Celcom Axiata Berhad, Malaysia’s telecommunications network provider. By integrating Koble’s app into the Celcom Business portfolio of services, the platform creates a network of business opportunities for small and medium-sized enterprises (SMEs) and larger enterprises in Malaysia at an unprecedented size and scope. Through the partnership, all Celcom Business customers will enjoy exclusive benefits such as preferential rates on Koble packages and tailored campaigns. While Celcom Business customers gain more from the exclusive partnership, the platform is also open to Malaysian enterprises that are outside the Celcom network. Although B2B purchasing online is more than double B2C buying, the current $300B digital advertising market is primarily geared towards consumers and dominated by platforms such as Facebook and Google. The lag in B2B advertising spend behind purchasing is largely due to the complex nature of B2B sourcing and buying. Frustration from the lack of access to qualified buyers leads. Nuisance and discomfort from cold unsolicited outreach and rejection. Wasted resources from the time spent searching and high marketing cost. Targeting: Allows businesses to pick the exact group of professionals or companies they want to start conversations with for their business - whether it’s a specific company or buyers of a matching interest. Readometer: Helps businesses to know how much time people have actually spent on their profile and content. It applies to pictures, PDF’s and embedded videos. Anonymous Chat: Enables buyers to hold their personal identity from their company ID and reveal it whenever they want to in the business relationship. Peer Performance Comparisons: Gives businesses the ability to compare their engagement and potential leads against the performance of peer vendors. TrueReview: Offers a Yelp-like element to B2B buying. Suppliers and buyers are ranked based on their reviews; meaning the better the recommendation, the higher the ranking. Koble enters the market with an innovative pricing strategy. Unlike most social networks or lead generation technologies that charge per impression or per click, Koble’s subscription pricing is largely driven by successful connections with other businesses. Koble users can start for free, paying only after their first two conversations get responded to by other businesses. This pricing model focuses on creating genuine connections between businesses and generating a return on investment for both buyers and sellers. Koble outpaces any business networking solution on the market today with a 33% response rate on the platform. With monthly subscription starting at RM40 a user per month, Koble reduces to the cost of a qualified lead to a fraction of the cost Malaysian businesses are paying for qualified leads today. A Google Survey commissioned by Koble in July 2018 found that Malaysian businesses are currently paying between RM300 to RM900 Malaysian for a qualified lead. 3 months of the Koble Pro Plan for free with an annual commitment to the plan. 50% off the Koble Starter and Pro Plan list prices. Celcom Axiata is the first to market Koble in Asia. 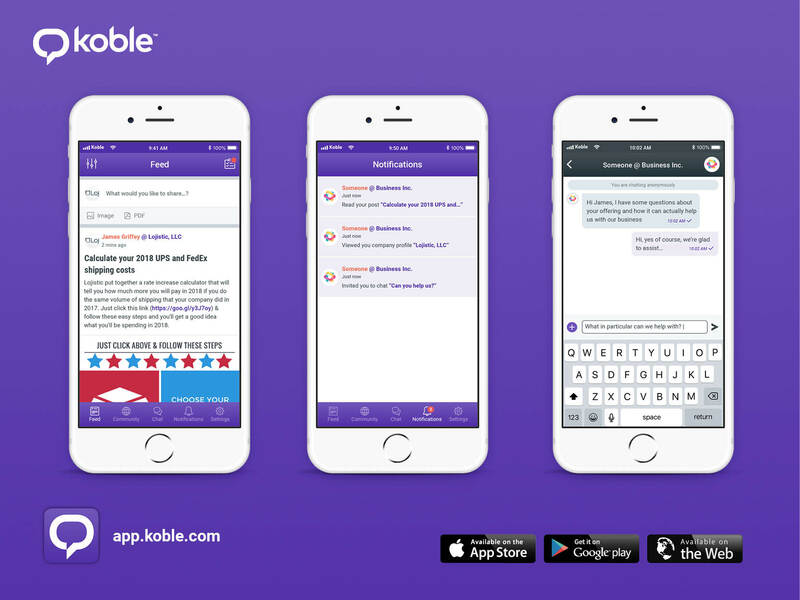 The Koble platform, accessible on the web at Koble.com, and through the iTunes App Store and Google Play Store, is currently used by professionals working with GE, Oracle, Harley Davidson, AXA, Sprint, Carlsberg and thousands of SMEs seeking to do business globally.